With all of the effort humans put into finding and generating energy, it might come as a surprise to some folks that there is already energy all around us just going to waste. 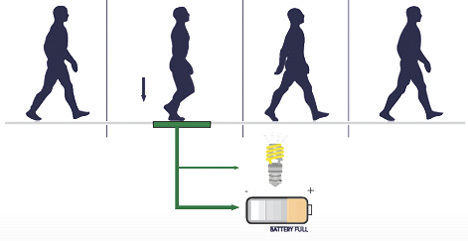 Kinetic energy is generated from movements we make every day, but it is rarely harnessed or utilized. The Pavegen System turns kinetic energy from footsteps into real electric power that can be used for a wide variety of applications. 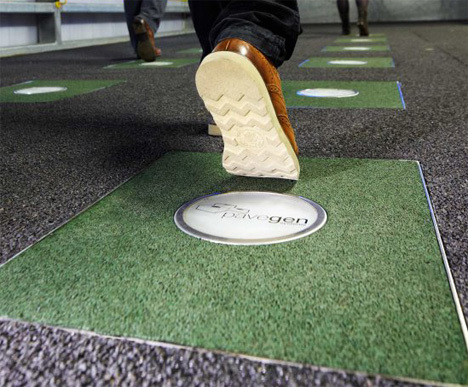 As people step on Pavegen paths, their footfalls cause plates to depress slightly which generates energy. The energy is stored in batteries and can then be used to power street lights, speakers, alarms, lighting and even advertising signage. The system requires no effort on the part of the people who use it; the normal movements they already make everyday would be enough. Pavegen is looking at a number of settings for their technology. The kinetic energy paths would be most useful in locations that already see significant foot traffic, such as inside malls or schools. Offices or transport hubs would also be ideal locations, and the installation of an energy-generating path would significantly reduce energy bills wherever it’s installed.